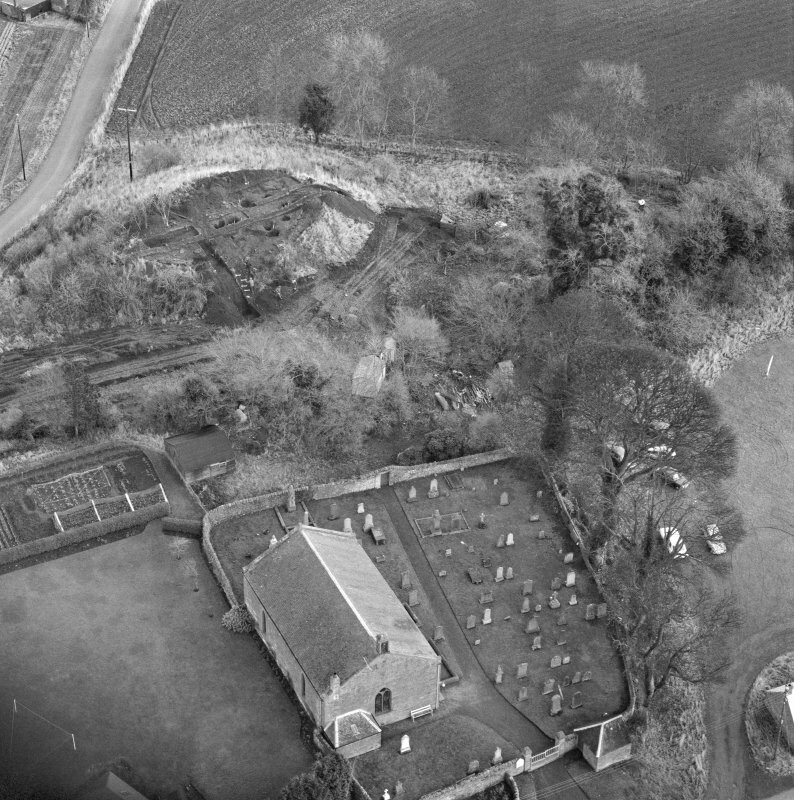 Oblique aerial view of Barton Hill motte under excavation and Kinnaird Parish Church and churchyard. 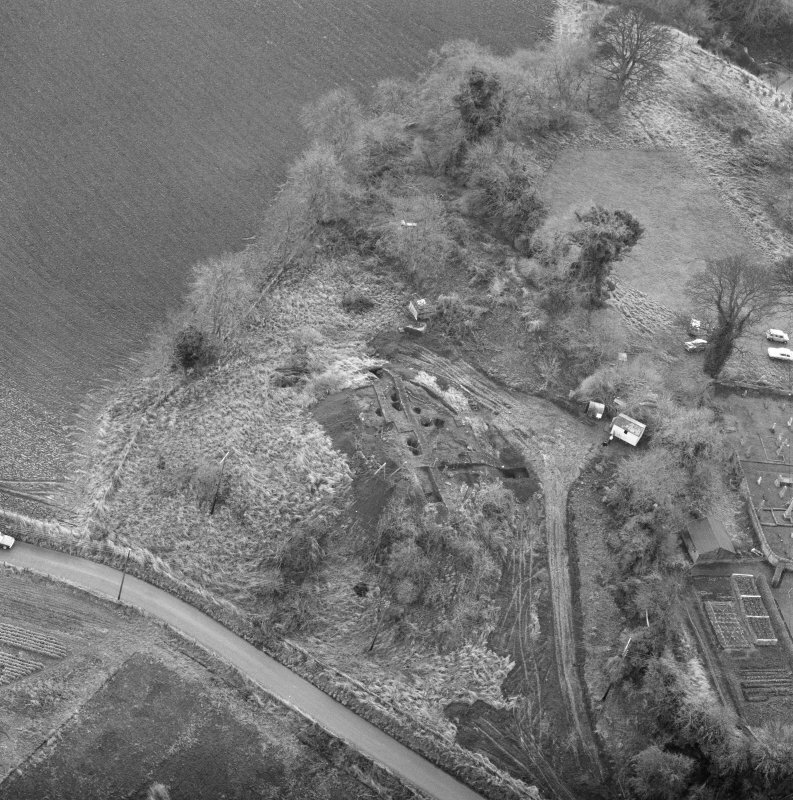 Oblique aerial view of Barton Hill motte under excavation. 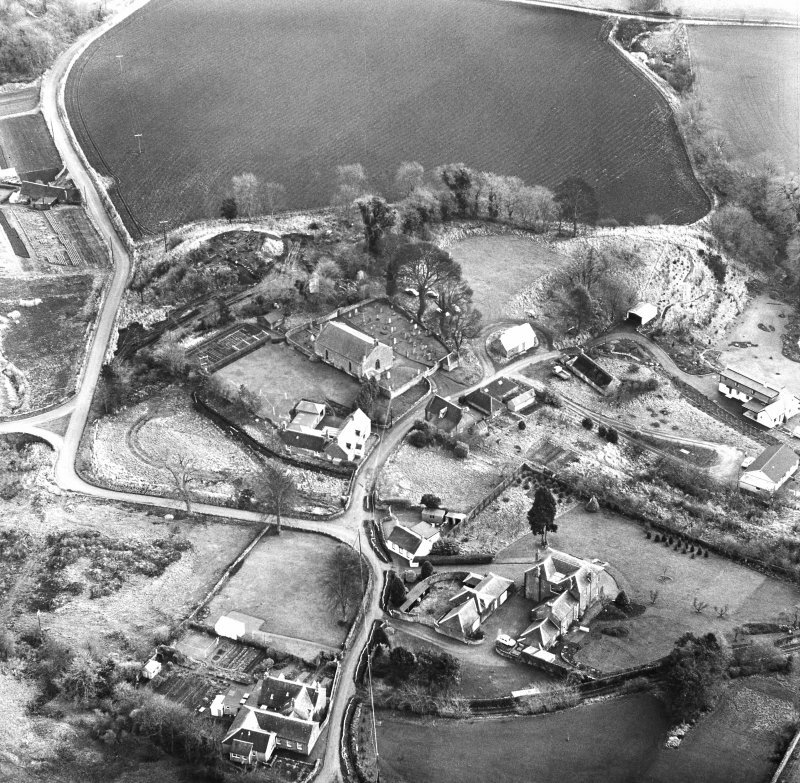 Oblique aerial view centred on the remains of the motte and the church and burial-ground, taken from the NW. 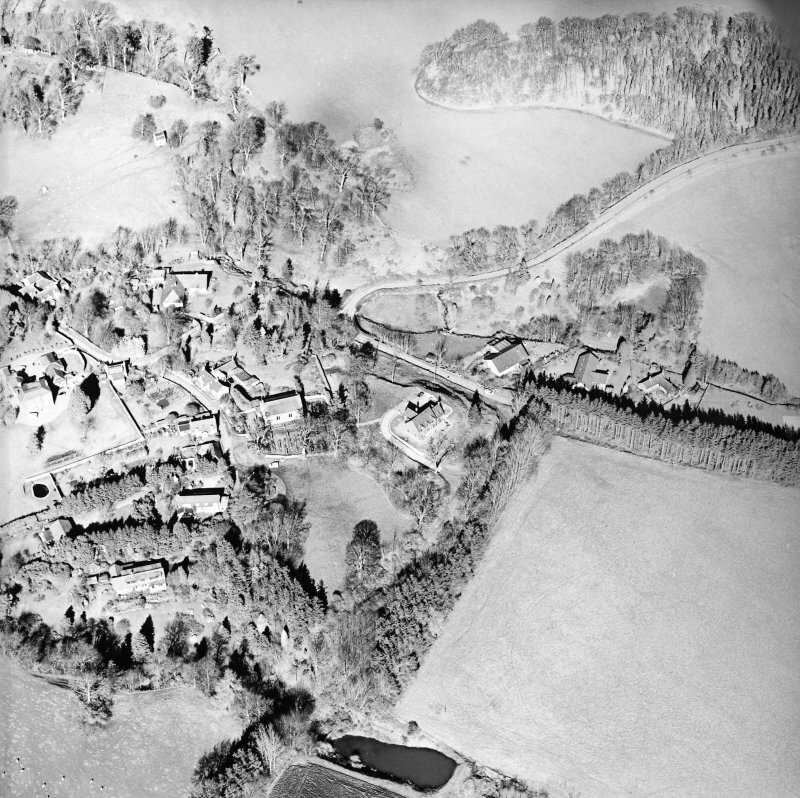 Oblique aerial view of Barton Hill motte under excavation and Kinnaird village. 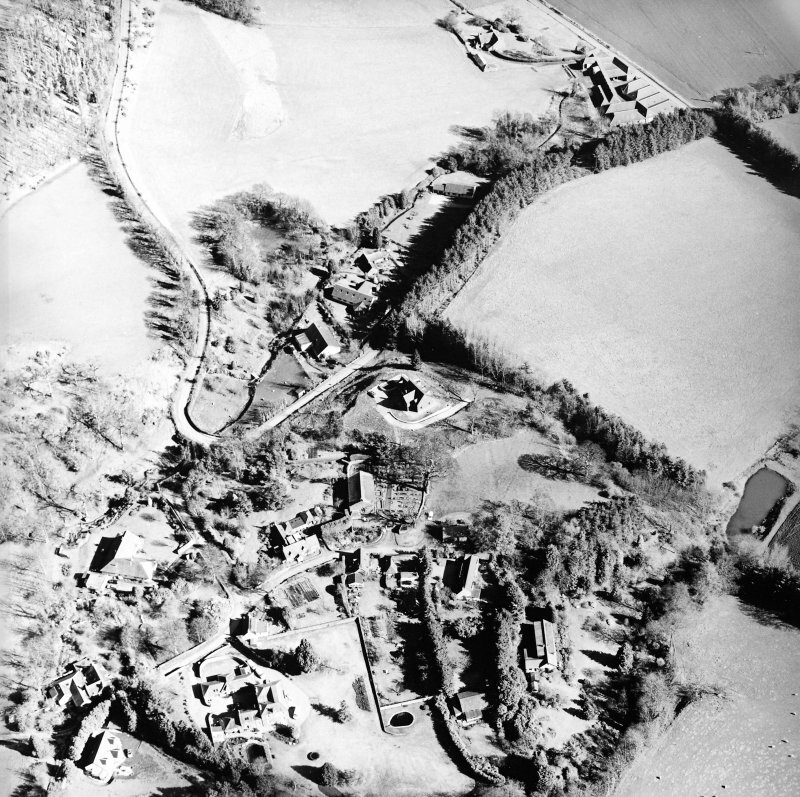 Oblique aerial view centred on the remains of the motte and the church and burial-ground, taken from the S.
Oblique aerial view centred on the remains of the motte and the church and burial-ground, taken from the SE. 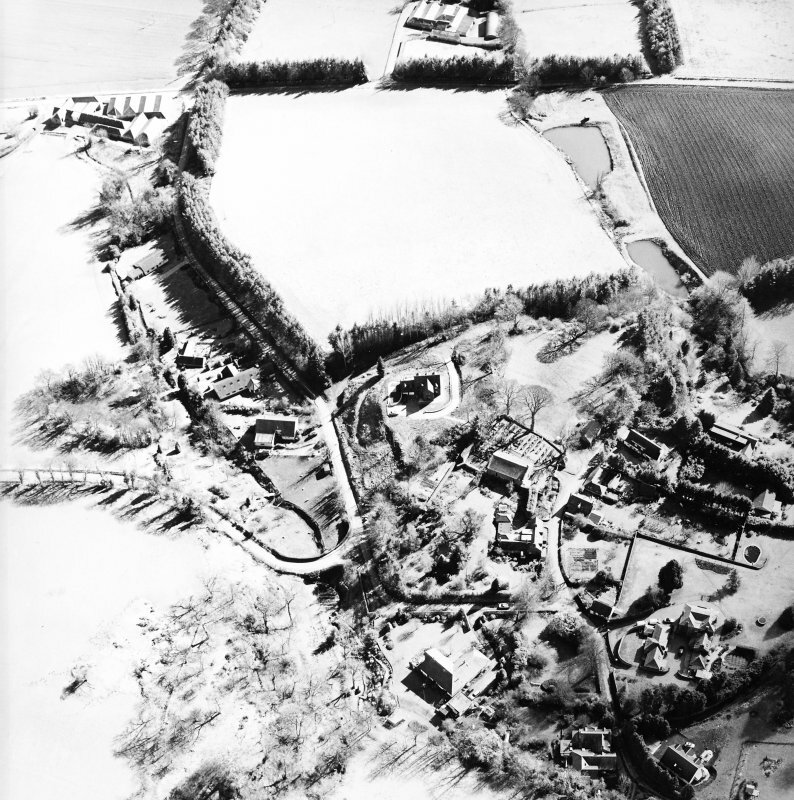 Oblique aerial view centred on the remains of the motte and the church and burial-ground, taken from the WSW. 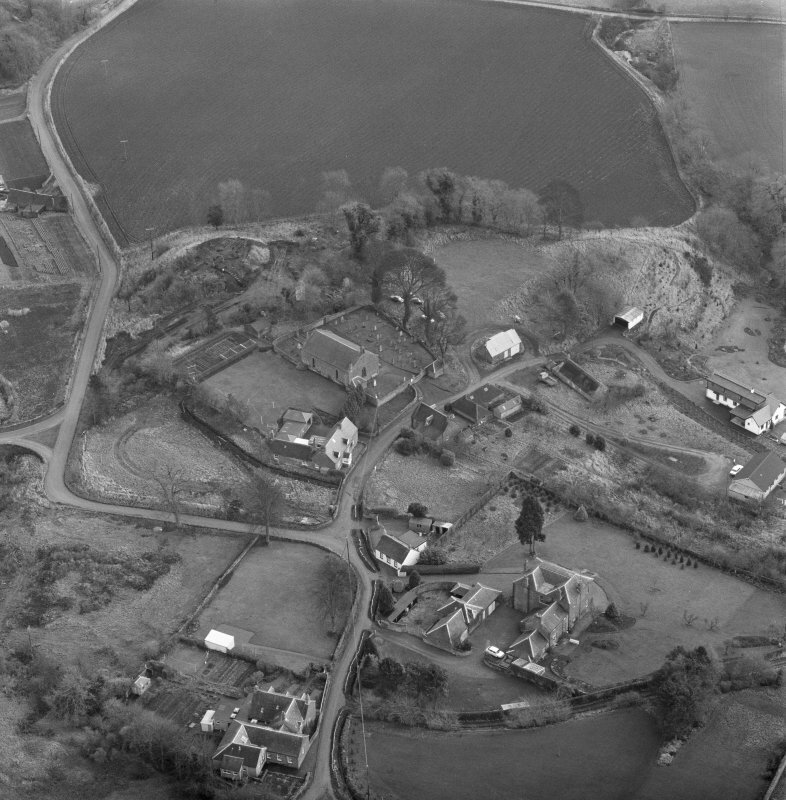 (NO 2436 2854) Motte, Barton Hill: This prominent mound, a plug of andesite 70 yds E of Kinnaird church, was the subject of a rescue excavation on behalf of the DoE in December 1971. The summit of the mound measured 24.7m N-S by 18.4m transversely. The sides of the mound to N and E were long and precipitous but shorter to S and W. Excavation exposed all but the NE quadrant of the top of this mound. 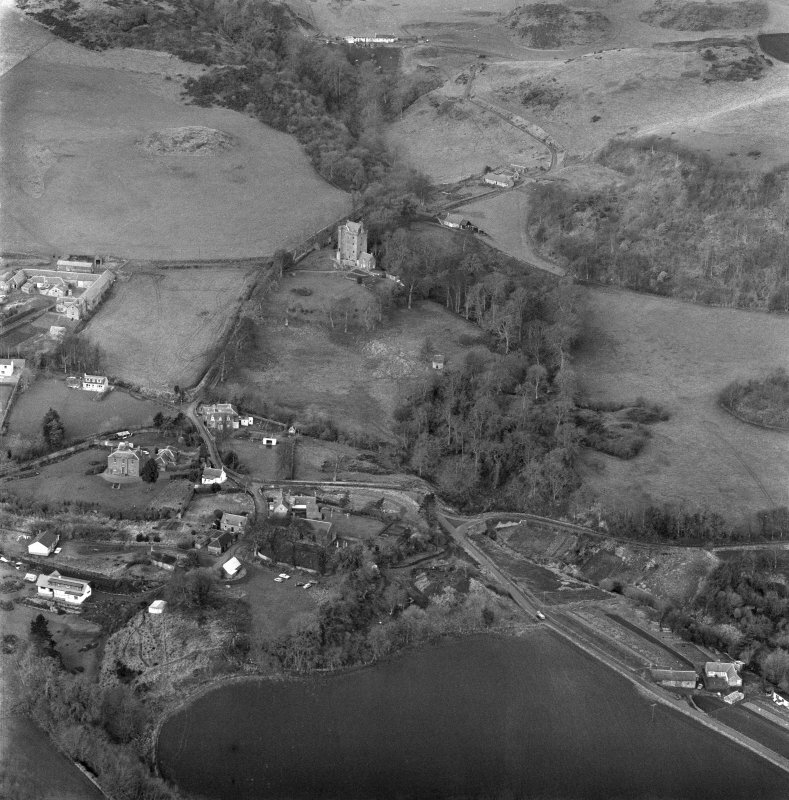 The S half had been dished and here eleven rock-cut pits were found. Four averaged 1m in diameter and depth and were arranged on the corners of a quadrilateral aligned NW to SE measuring centre to centre an average of 4m. The remaining seven pits were smaller and were disposed three a side on three sides of a larger quadrilateral with the same alignment and measuring centre to centre an average of 6m. 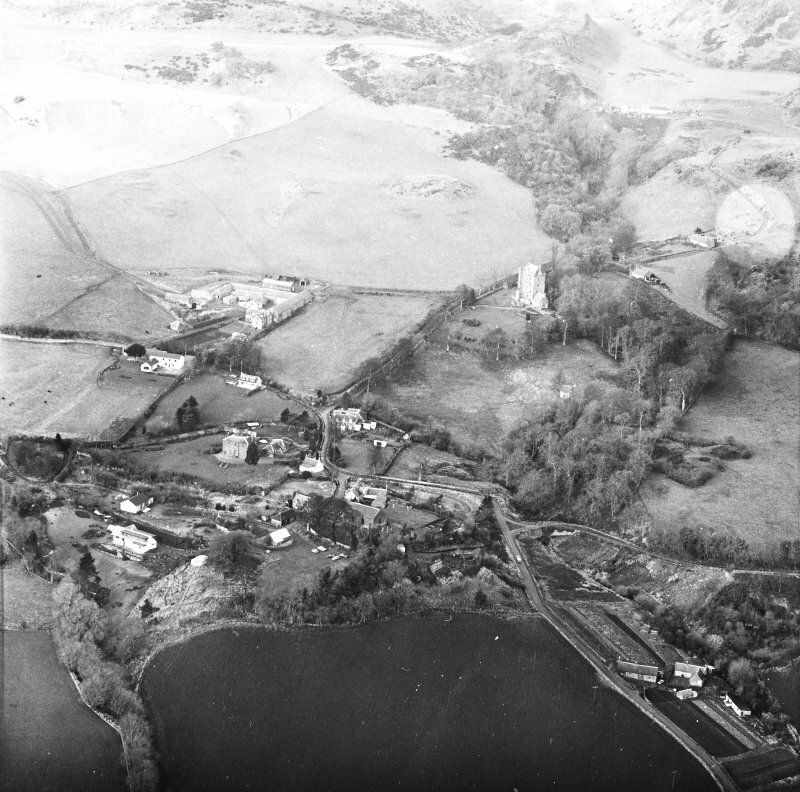 The SW pit of this arrangement was found to be linked to a rock-cut timber slot which extended half the distance along the NW side. 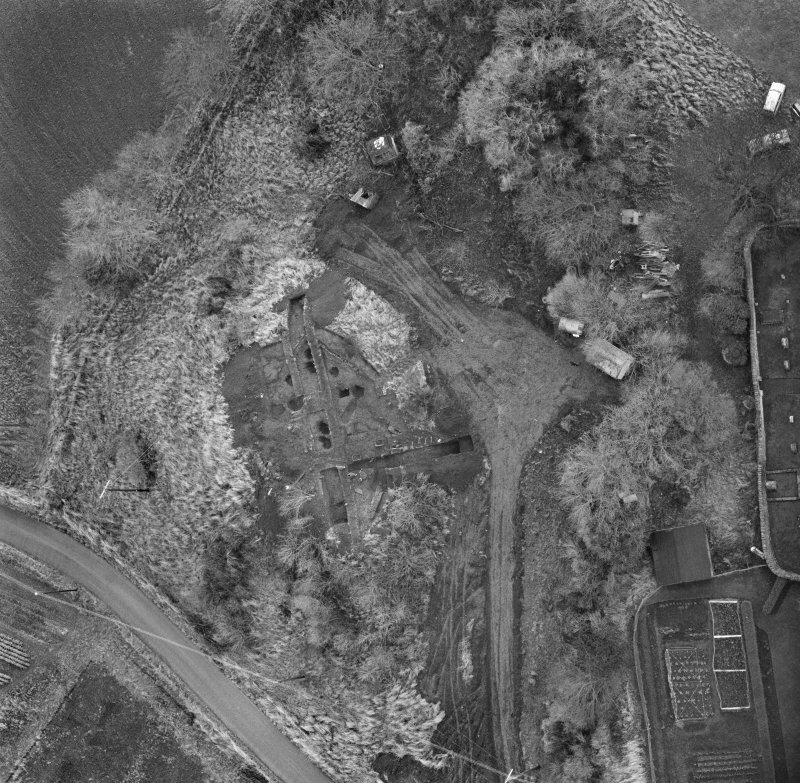 The larger pits of the inner setting held the timbers of a tower house surrounded by a post and log fence with an opening in the E half of the NW side. 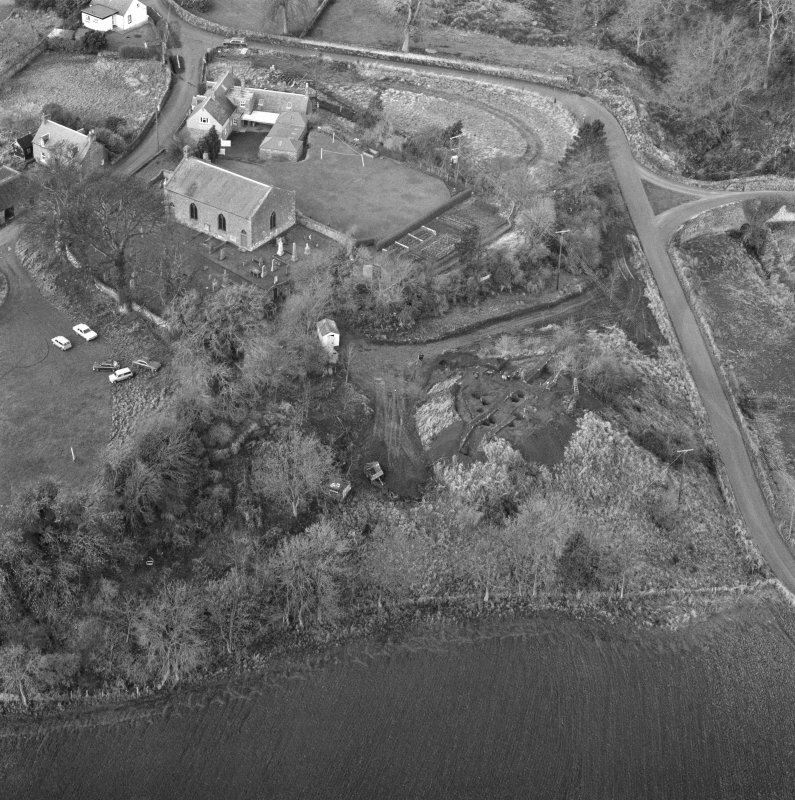 The S end of the summit had been protected by a low drystone wall acting as an inner revetment to a wooden stockade. 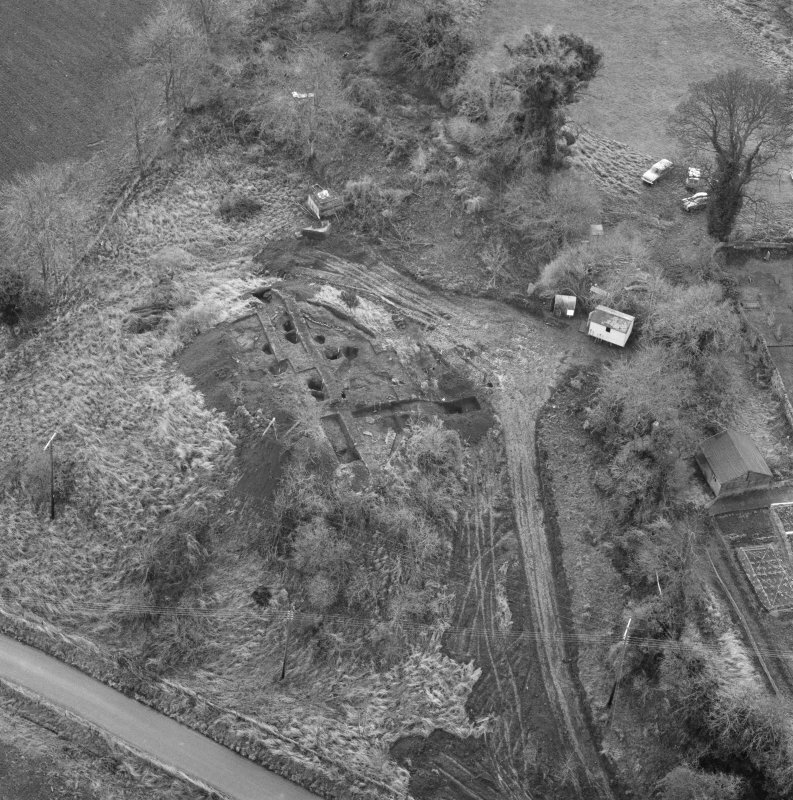 The N end of the site had been roughly paved and from this area a quantity of domestic debris was recovered including 13th - 14th century pottery. There were also two pieces of Samian ware. Further finds from the excavation have been added to the material in Perth Museum (Accession no. PMAG 1984.393-417). 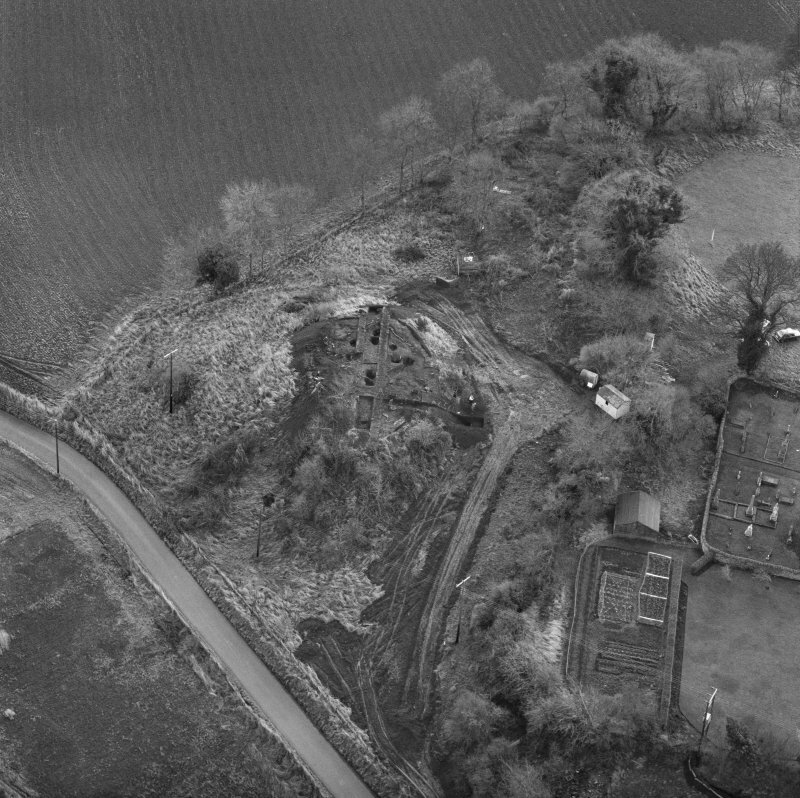 This motte was probably the caput of the Barony of Kinnaird, which was granted to Ralph Ruffus in 1172 x 4 (Reg Reg Scot 1971). It has been fashioned from a natural knoll and a modern house now stands on its summit. There is no evidence to indicate the presence of a bailey. 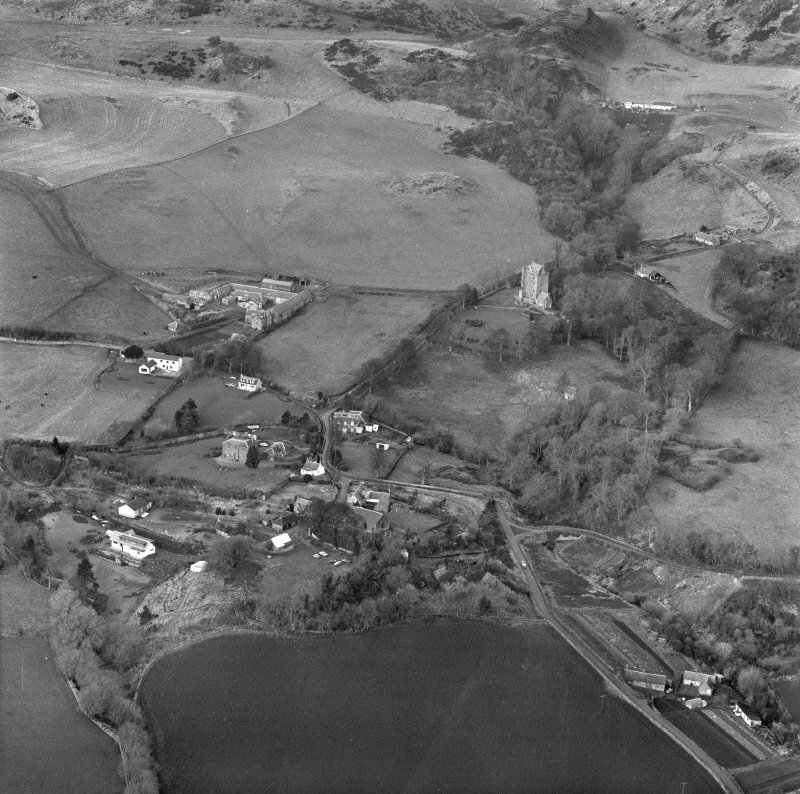 Visited by RCAHMS (PC) June 1989. NO 2436 2865 The work undertaken on 26 September 2007 involved monitoring the foundations for a new garage to the NE of the main house. 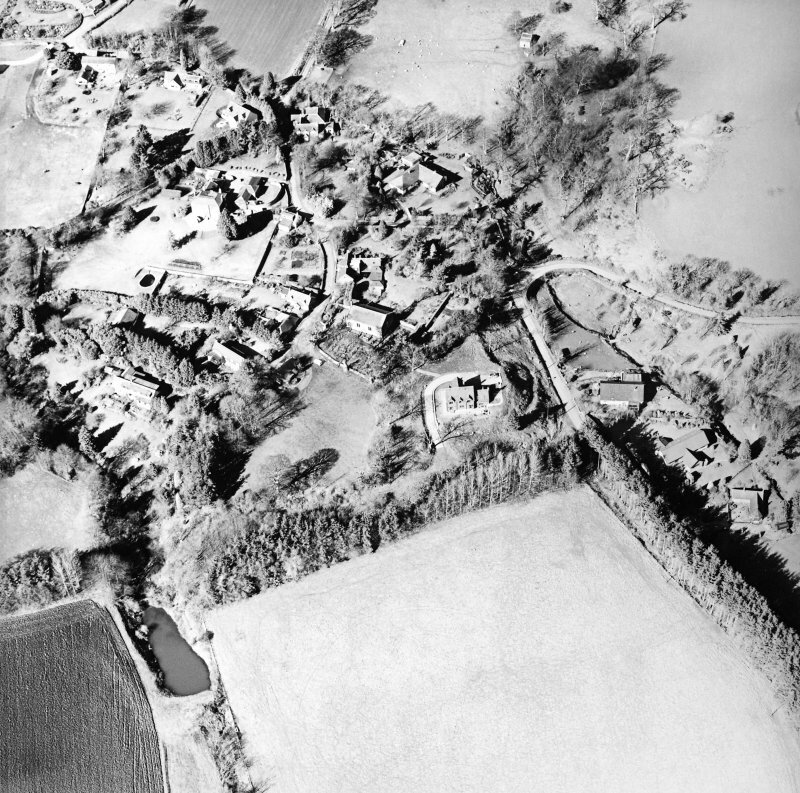 No significant features were found but the foundations revealed deposits relating to landscaping the mound in the late 1990s.